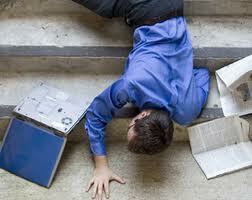 We have represented hundreds of victims as a slip and fall lawyer. If you slipped and fell on snow and ice, then it is important to determine whether that snow and ice was an unnatural condition. A few examples of unnatural accumulation of snow and ice would be leaking water that froze from a faulty gutter or roof, accumulations of water in cracks or holes in a walkway surface, or ruts in snow and ice caused by pedestrian or vehicle traffic. It is extremely important to take photos of the condition and location of where you fell to help your slip and fall lawyer get you the best results. You deserve to work with a slip and fall lawyer who will work hard to protect your family after an injury. If you or a family member has suffered a serious injury in a slip and fall accident in the West-Central Missouri area, we encourage you to contact the Law Office of Jeffery A. Hanna. Our experience, our track record of success, and our dedication to the well-being of our clients who have been injured, make choosing us as your slip and fall lawyer a logical decision. As a slip and fall lawyer, we are ready and willing to come to you, in your home, hospital room or elsewhere, to explain how we can help you after you have suffered a head injury, broken hip, back injury or any type of injury when you fell on steps, in a parking area or in the produce section of your local supermarket or any other place that had a defect causing you to slip and fall. I am Jeffery A. Hanna, founder of this law firm. I personally make sure that every client of the Law Office of Jeffery A. Hanna receives personalized service and aggressive, effective advocacy. Contact a results-driven slip and fall lawyer by phone at (660) 747.2550 or e-mail us to schedule a free initial consultation.